Spinach/Palak leaves are healthy, rich in iron and nutrition. 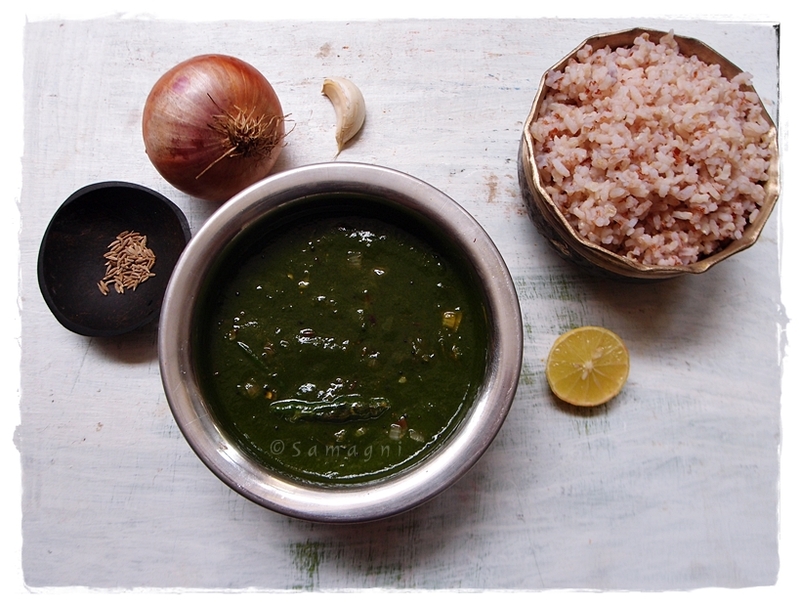 This super simple palak recipe is made with limited ingredients and goes well with rice as well as roti. In this recipe, I have steamed and pureed the spinach leaves. You may choose to just use chopped spinach leaves. I prefer the pureed spinach. You may also add cooked tur dal/split pigeon peas or split mung dal to this curry to increase volume and nutrition. Clean and wash the spinach leaves well in water. Drain and place in a double boiler or pressure cooker to steam the leaves. You will notice that the leaves have wilted, turned dark green, and reduced significantly. Peel the garlic and onion. Chop finely and keep aside. When the steamed spinach leaves cool down a bit, puree it using a mixer. Keep aside. In a wok, add oil and jeera, slit green chilies and garlic. Saute. Add finely chopped onion and tomato. Saute for 2-3 mins. Add the pureed spinach into this. Bring to boil. Add salt.